On Freedom and Independence. Finding the Spirit of Freedom in the American Dream. God bless America. Sermon Delivered on July 4, 2010 by Fr. Vazken Movsesian at the Armenian Church Youth Ministries Center, Glendale. On Freedom and Independence. On the trappings of Materialism- a different twist on the fish and the loaves. Freedom allows us to run to Costco and the Lexus dealer, but does it prohibit us from our children’s schools and visiting our parents? Sermon Delivered on July 4, 2010 by Fr. 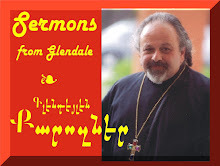 Vazken Movsesian at the Armenian Church Youth Ministries Center, Glendale. On Matthew 13 - Parable of the Weeds. Why does God put up with evil? And what you can do about it! Sermon Delivered by Fr. Vazken Movsesian and recorded LIVE at the Armenian Church Youth Ministries Center, Glendale, CA June 27, 2010.